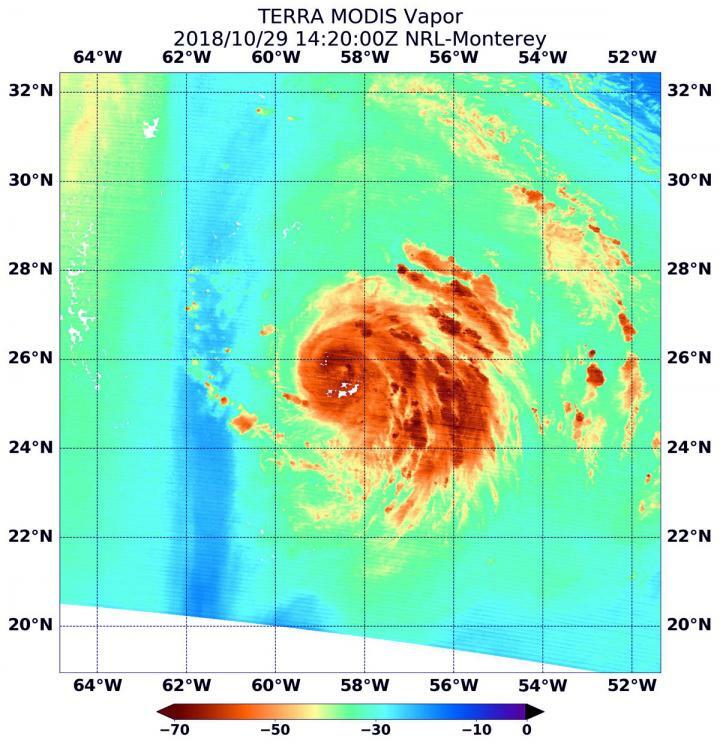 When NASA's Terra satellite passed over the Central Atlantic Ocean on Oct. 16 the MODIS instrument aboard analyzed water vapor within Hurricane Oscar. On Oct. 29 at 10:20 a.m. EDT (1420) NASA's Terra satellite passed over Oscar and provided visible and water vapor imagery of the newest Atlantic Hurricane. The National Hurricane Center said "Oscar's convective cloud pattern has continued to improve since the previous advisory, with a small, cloud-filled eye now apparent in visible satellite imagery and also in a recent microwave pass. In addition, cirrus outflow has been expanding in all quadrants, especially in the eastern semicircle." The National Hurricane Center or NHC said at 11 a.m. EDT (1500 UTC) the eye of Hurricane Oscar was located near latitude 25.8 degrees north and longitude 58.4 degrees west. That's about 590 miles (955 km) southeast of Bermuda. Oscar is moving toward the west-northwest near 7 mph (11 kph). A turn toward the northwest at a slower forward speed is expected later today, followed by a motion toward the north tonight. Maximum sustained winds have increased to near 85 mph (140 kph) with higher gusts. Additional strengthening is forecast through Tuesday, followed by gradual weakening thereafter. The estimated minimum central pressure is 981 millibars.